Metal Arbours - Who Has The Best Metal Arbours On Sale? 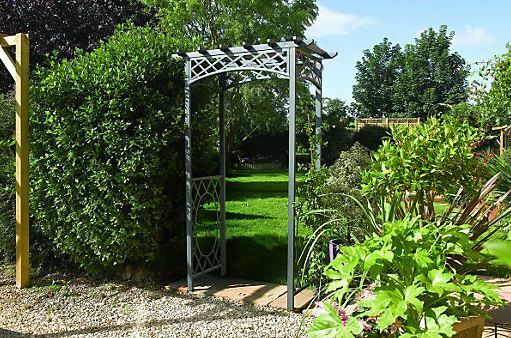 Metal arbours are a highly practical modern twist on the traditional garden favourite. Timber arbours have long been a highly prized garden structure, providing a shaded area in which to sit and look out as the landscape, as well as being a beautiful feature in their own right. Metal arbours take this concept and add the durability that comes with a metal substrate, as well as adding an exciting contemporary look that fits in well with a modern home. We believe that they’re going to become increasingly popular, which is why we’ve created this WhatShed guide to the best metal arbours that can be bought online in the UK today. Deciding the final order of our top five metal arbours was no easy task, but of course we had to take the pricing and overall value for money into account. We also looked at the looks and aesthetic appeal of each arbour, and any value adding features that they had. In this way we’ve been able to create a list that has high quality metal arbours that are suitable for all gardens and all budgets. With five high quality but very different metal arbours to choose from, selecting the very best was a difficult task. Well done then to the Lady Elinore garden arbor which comes out on top of the other metal arbours thanks to its good value, durability, and unique cast iron appearance. 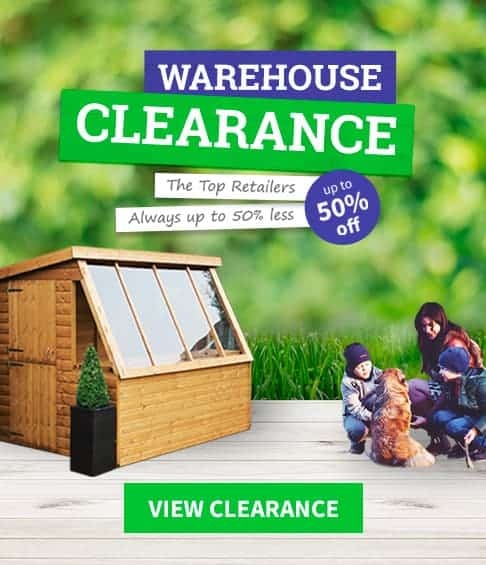 Whether you’re looking for an arbour as a focal point for your garden, or the practicality of a high quality wooden toolshed, WhatShed will bring you the comprehensive and independent reviews that can help you make the right purchase. Metal arbours can have a distinct look all of their own, as this fine example shows. More delicate and elegant than traditional timber-made arbours, we found it to be a real head turner in the garden and of course it brings many advantages when compared to wooden garden structures. Foremost among these are that it’s practically maintenance free, with no need to worry abour rot, painting, or insect attack. 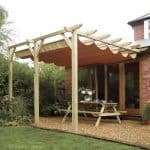 Another advantage is that on average they are cheaper than a wooden arbour. This combination of a beautiful design for a great value price, with the in built practicality of an integral bench area, is enough to take this to the very top of our league table. Unlike most other metal arbours we’ve reviewed, this is made not of steel or aluminium but of wrought iron. That gives it a vintage look that you can imagine taking a central place in an Edwardian garden, and yet it’s just as striking today. 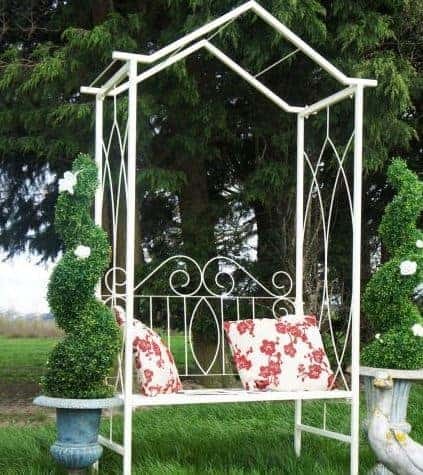 Immaculately painted in cream, the bottom portion contains an iron bench with dimensions of 1.21 x 0.61m, with the peak of the arbour rising 2.15m above ground level. 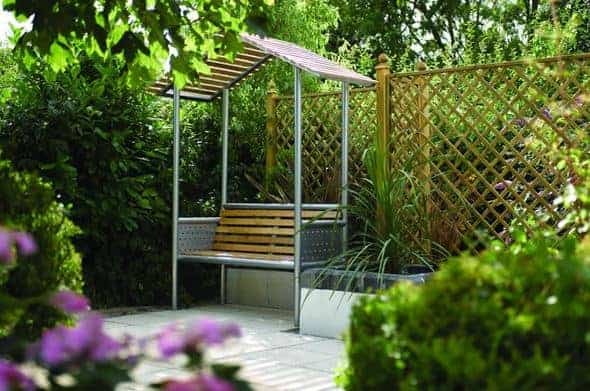 That means there’s more than enough room for two people to sit and relax in what us for us a very high quality metal arbour at a very reasonable price. Whilst the main constituent of this beautiful garden structure is aluminium, it differs from most other metal arbours that we’ve seen in that it also features hardwood for the seat and for the slatted roof. The contrasting colours of silver and golden brown help to make this one of the most original and eye catching arbours that we’ve seen. 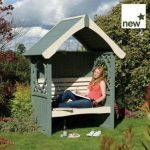 It’s also significantly larger than most arbours that we’ve reviewed, with a width of 1.73m and a depth of 0.80m underneath a height of 2.15m, it’s perfect for big gardens or for people who plane to use it as a gathering point for a garden or dinner party. The use of aluminium for the frame not only adds to its aesthetic appeal, it also creates a structure that’s strong and durable and yet lightweight and easy to construct. We were pleased to find that the hardwood used was eucalyptus taken from a sustainable source, and therefore FSC certified. This is a very tough wood which is naturally resistant to rot, although we still feel that the timber sections will need inspecting and possibly preserving on an annual basis. Nevertheless, this combination of original and exciting looks, with larger than average dimensions, is enough to claim the runner up spot in our league table of the very best metal arbours. From a distance this could almost be a very finely worked wooden garden arbour, until you get up close and that was when we appreciated this structure in its full beauty. That’s because these metal arbours are made from tough steel that’s been painted in a dark copper colour, which can easily be mistaken for a dark timber such as walnut or rosewood. What we found particularly attractive about it, however, were the decorative flourishes in the design of roses; they give this arbour a very traditional look even though being made of steel it presents lots of benefits that a wooden arbour doesn’t. You won’t have to think about adding paint or preservative, and so this should remain looking just as good for years to come. This isn’t one of the larger metal arbours we’ve reviewed, which is the only thing preventing it from being placed even higher up our league table, and yet with a width of 1.22m and a depth of 0.54m the integrated seating still feels comfortable. We liked the way that the edge of the metal seat is curved as well, making it kinder on the backs of the legs. 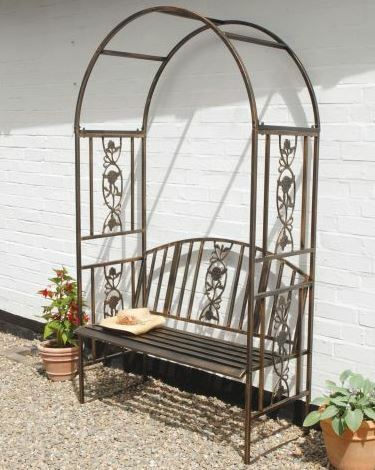 This represents excellent value for money, and we feel it would be a great choice for those who want a metal arbour with a very traditional appearance. 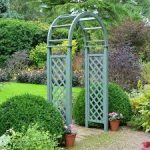 We’ve reviewed lots of garden arches, and yet this is one of the most attractive that we’ve seen making it ideal for the growing and displaying of climbing plants such as ivy or roses or simply as a decorative feature for the garden. 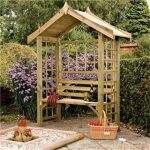 It’s also wide enough to take a garden seat, which is why we feel this would make an ideal arbour, providing a shaded area for you to enjoy the surrounding landscape from. At a price of not much more than a hundred pounds, it’s also easily affordable, and that’s why it earns a place in the five best metal arbours that can be purchased online right now in the UK. We were impressed by just how tough the steel used for the construction is, and so it should prove to be very resilient and eye catching. We particularly liked the gunmetal grey colour scheme that helps elevate it appearance wise above the silver arbours and arches that we’ve seen; because the colouring is powder coated it’s also very knock and scratch resistant, which we always think is important in a garden environment. 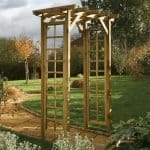 Another feature that caught out eye was the used of trellised side panels, which is why it’s ideal for gardeners looking for a low cost alternative to traditional wooden arbours. Here we have another Winchester arbour in our top five league table, and yet it couldn’t be more different to the one that preceded it. This is, in effect, a combination of wooden and metal arbours, and it manages to combine the best of both substrates. 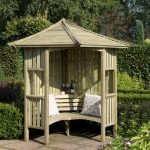 The seating section, sides and back are made of high quality softwood timber, so it will appeal to people who love the classic look of a wooden garden arbour. At the top however is an arched steel roof which gives it a very stylish and original appearance, as well as providing extra weather protection to anybody sitting within the arbour and to the structure as a whole. We were pleased to see that the timber section had been pressure treated by the manufacturer, and that it comes with a 10 year guarantee against rot. The roof is immune to rot of course, which is one of the major benefits that metal arbours bring, and being made of high grade steel it should be resistant to rust as well. 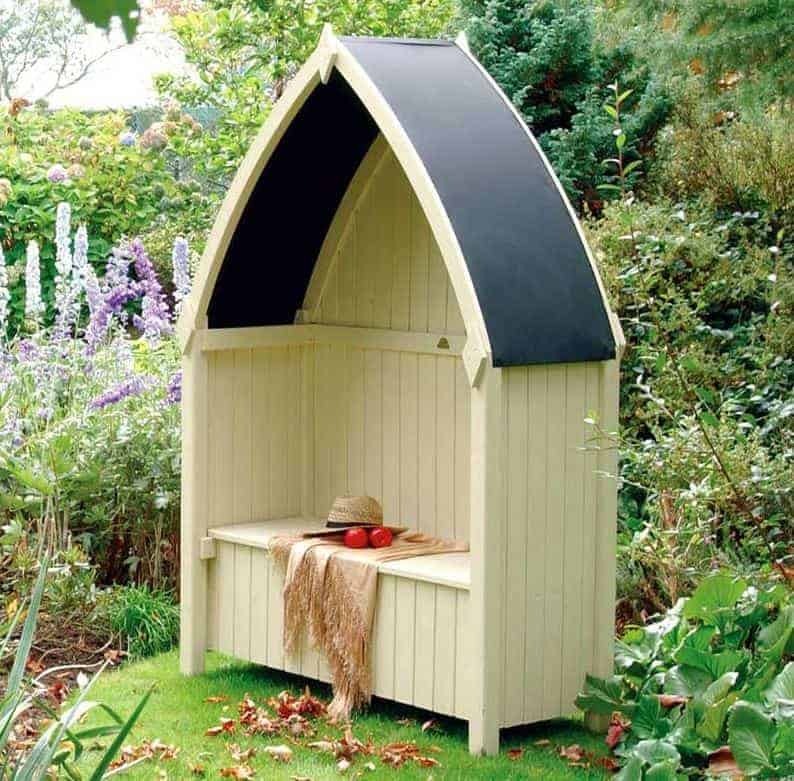 If you want a truly unique arbour that makes a perfect place to sit and relax inside your garden, then we feel that this should be one for your shortlist, and with dimensions of 1.39 x 0.67m there’s even enough room for two people to share.